detail installatie "what colour is abuse" in de Mariënkirche in Düren (Dld), 2013 Central to this installation will be the object “cloak of love” (h. 285 cm)), spread out on the floor, hanging on an cast iron coat-rack about 300 cm. high.The cloak is empty, in it the object "woman's arm" and a left-over damaged toy. Next to it on the left the painting "Virgin Mary". 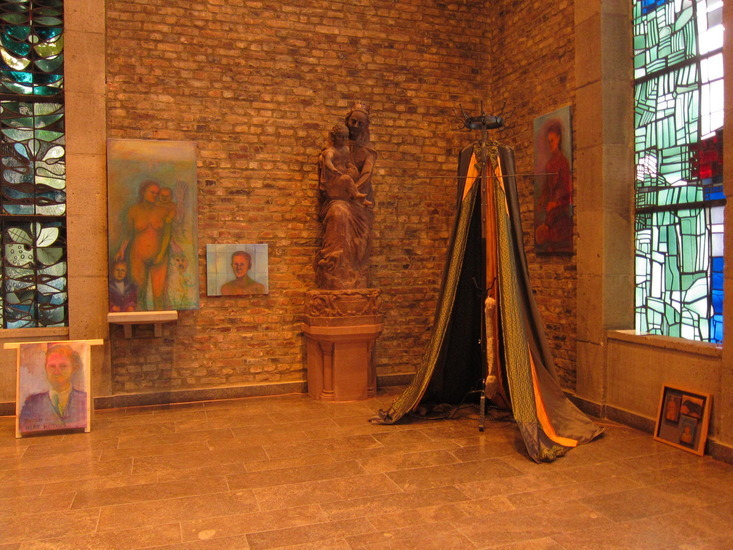 Also: Portraits of Henk Heithuis, dressed and undressed, a victim of abuse in the catholic church.